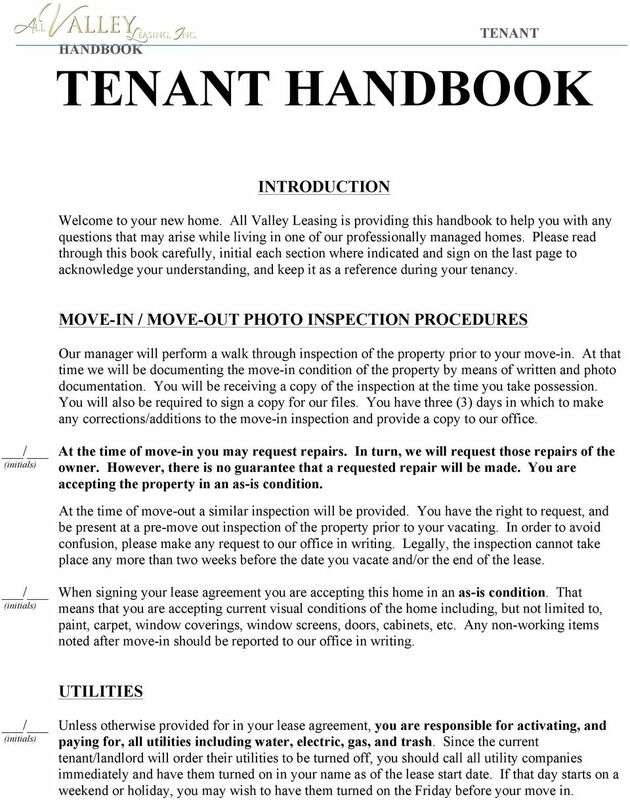 Download "INTRODUCTION MOVE-IN / MOVE-OUT PHOTO INSPECTION PROCEDURES"
1 HANDBOOK HANDBOOK INTRODUCTION Welcome to your new home. All Valley Leasing is providing this handbook to help you with any questions that may arise while living in one of our professionally managed homes. Please read through this book carefully, initial each section where indicated and sign on the last page to acknowledge your understanding, and keep it as a reference during your tenancy. MOVE-IN / MOVE-OUT PHOTO INSPECTION PROCEDURES Our manager will perform a walk through inspection of the property prior to your move-in. At that time we will be documenting the move-in condition of the property by means of written and photo documentation. You will be receiving a copy of the inspection at the time you take possession. You will also be required to sign a copy for our files. You have three (3) days in which to make any corrections/additions to the move-in inspection and provide a copy to our office. At the time of move-in you may request repairs. In turn, we will request those repairs of the owner. However, there is no guarantee that a requested repair will be made. You are accepting the property in an as-is condition. At the time of move-out a similar inspection will be provided. You have the right to request, and be present at a pre-move out inspection of the property prior to your vacating. In order to avoid confusion, please make any request to our office in writing. Legally, the inspection cannot take place any more than two weeks before the date you vacate and/or the end of the lease. When signing your lease agreement you are accepting this home in an as-is condition. That means that you are accepting current visual conditions of the home including, but not limited to, paint, carpet, window coverings, window screens, doors, cabinets, etc. Any non-working items noted after move-in should be reported to our office in writing. UTILITIES Unless otherwise provided for in your lease agreement, you are responsible for activating, and paying for, all utilities including water, electric, gas, and trash. Since the current tenant/landlord will order their utilities to be turned off, you should call all utility companies immediately and have them turned on in your name as of the lease start date. If that day starts on a weekend or holiday, you may wish to have them turned on the Friday before your move in. 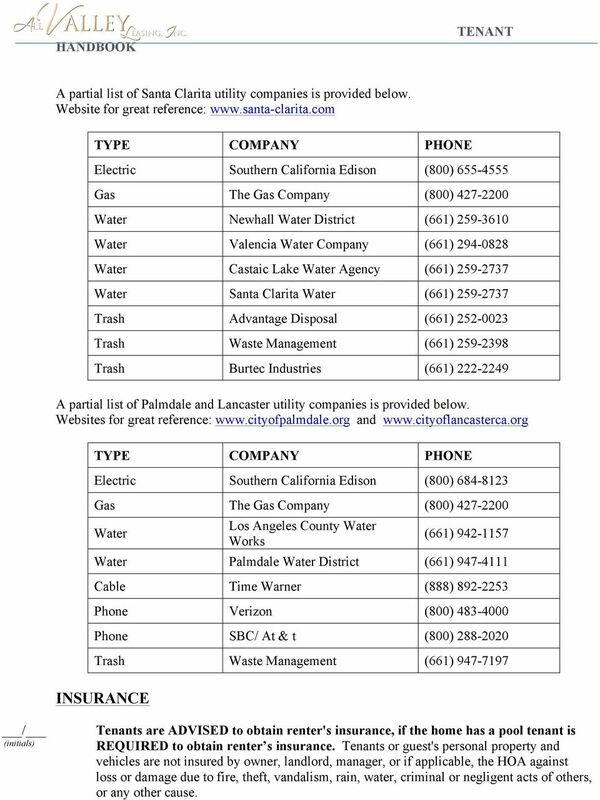 2 A partial list of Santa Clarita utility companies is provided below. Website for great reference: TYPE COMPANY PHONE Electric Southern California Edison (800) Gas The Gas Company (800) Water Newhall Water District (661) Water Valencia Water Company (661) Water Castaic Lake Water Agency (661) Water Santa Clarita Water (661) Trash Advantage Disposal (661) Trash Waste Management (661) Trash Burtec Industries (661) A partial list of Palmdale and Lancaster utility companies is provided below. Websites for great reference: and TYPE COMPANY PHONE Electric Southern California Edison (800) Gas The Gas Company (800) Water Los Angeles County Water Works (661) Water Palmdale Water District (661) Cable Time Warner (888) Phone Verizon (800) Phone SBC/ At & t (800) Trash Waste Management (661) INSURANCE Tenants are ADVISED to obtain renter's insurance, if the home has a pool tenant is REQUIRED to obtain renter s insurance. Tenants or guest's personal property and vehicles are not insured by owner, landlord, manager, or if applicable, the HOA against loss or damage due to fire, theft, vandalism, rain, water, criminal or negligent acts of others, or any other cause. 3 Tenant shall comply with any requirement imposed on tenant by owner's, landlord's, or manager's insurer in order to avoid: an increase in owner's, landlord's, or manager's insurance premium; and/or, loss of insurance. PAYING RENT Rent is due on the first of the month. If rent is not received in our office by 5:00 P.M. on the 5th day of each month or paid online by 5:00 P.M. on the 3 rd day of each month, it is considered late and there will be a late charge applied as stipulated in your Lease Agreement Paragraph 6A. To ensure we receive your payment on time, we have many options available to pay rent: 1. Mail rent to our office at the address below. 2. Drop rent off in our offices during normal business hours as stipulated in your lease. 3. 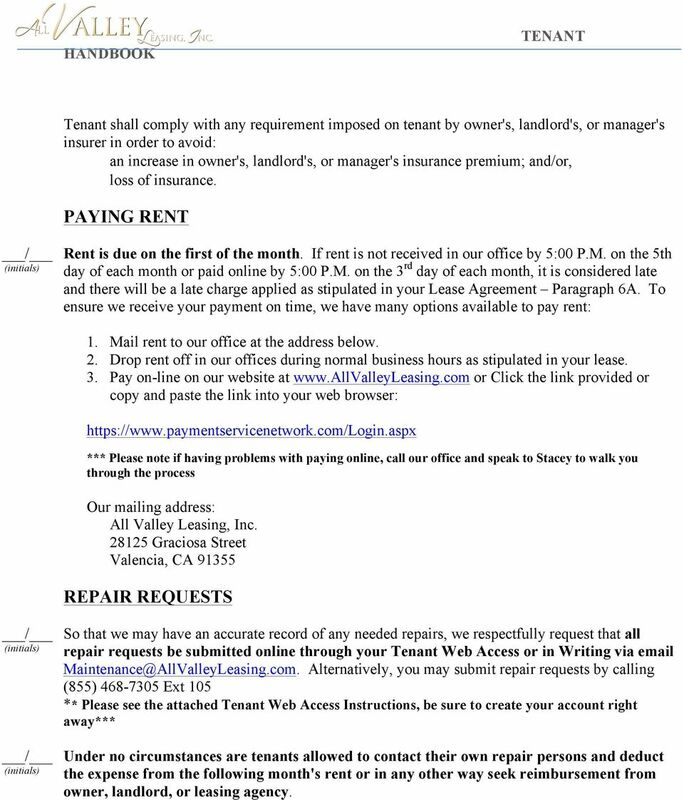 Pay on-line on our website at or Click the link provided or copy and paste the link into your web browser: *** Please note if having problems with paying online, call our office and speak to Stacey to walk you through the process Our mailing address: All Valley Leasing, Inc Graciosa Street Valencia, CA REPAIR REQUESTS So that we may have an accurate record of any needed repairs, we respectfully request that all repair requests be submitted online through your Tenant Web Access or in Writing via Alternatively, you may submit repair requests by calling (855) Ext 105 ** Please see the attached Tenant Web Access Instructions, be sure to create your account right away*** Under no circumstances are tenants allowed to contact their own repair persons and deduct the expense from the following month's rent or in any other way seek reimbursement from owner, landlord, or leasing agency. 4 EMERGENCIES There are few true emergencies. An emergency is a life-threatening situation such as a fire, flood and/or uncontrollable water, electrical problem, smell of gas, etc: Emergencies causing immediate danger such as fire, call 911 Emergencies involving gas call the gas company and if necessary, call 911 Emergencies involving IMMEDIATE electrical danger, call the utility service or 911 Emergencies involving a pipe burst or water leak, immediately turn off the water to the location. If you cannot get the water turned off at the property or street, please call the fire department. After contacting one of the above sources, then call your manager or the AVL office and report the problem. 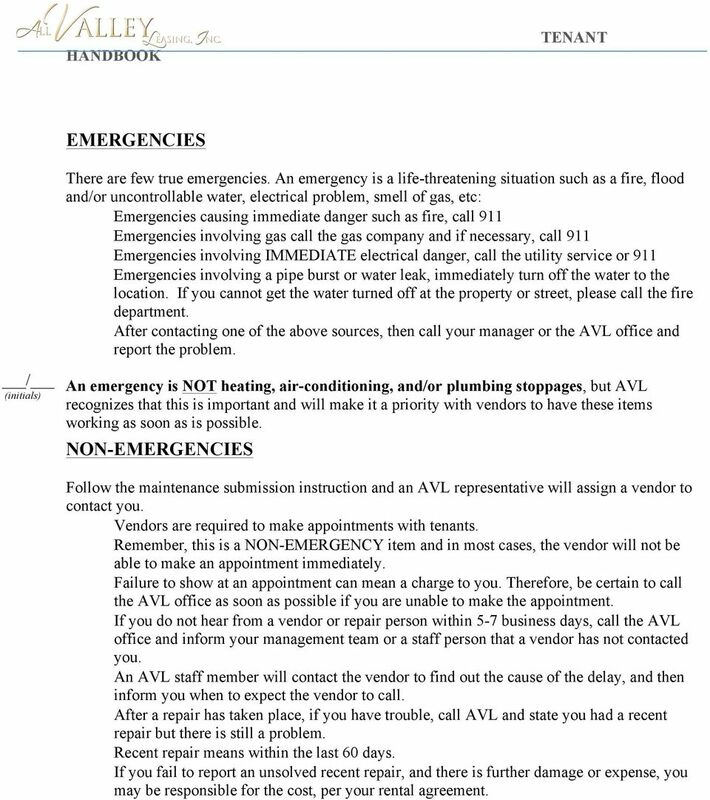 An emergency is NOT heating, air-conditioning, and/or plumbing stoppages, but AVL recognizes that this is important and will make it a priority with vendors to have these items working as soon as is possible. NON-EMERGENCIES Follow the maintenance submission instruction and an AVL representative will assign a vendor to contact you. Vendors are required to make appointments with tenants. Remember, this is a NON-EMERGENCY item and in most cases, the vendor will not be able to make an appointment immediately. Failure to show at an appointment can mean a charge to you. Therefore, be certain to call the AVL office as soon as possible if you are unable to make the appointment. If you do not hear from a vendor or repair person within 5-7 business days, call the AVL office and inform your management team or a staff person that a vendor has not contacted you. An AVL staff member will contact the vendor to find out the cause of the delay, and then inform you when to expect the vendor to call. After a repair has taken place, if you have trouble, call AVL and state you had a recent repair but there is still a problem. Recent repair means within the last 60 days. If you fail to report an unsolved recent repair, and there is further damage or expense, you may be responsible for the cost, per your rental agreement. 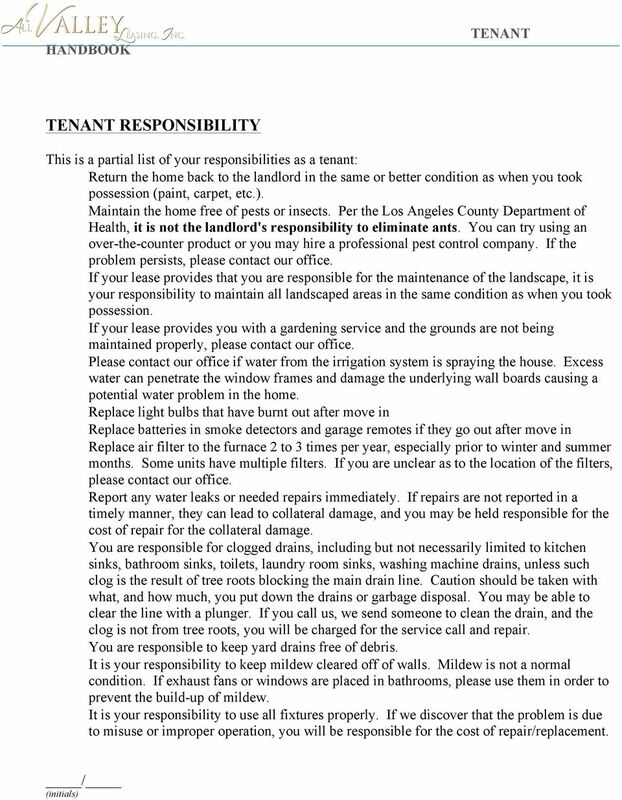 5 RESPONSIBILITY This is a partial list of your responsibilities as a tenant: Return the home back to the landlord in the same or better condition as when you took possession (paint, carpet, etc.). Maintain the home free of pests or insects. Per the Los Angeles County Department of Health, it is not the landlord's responsibility to eliminate ants. You can try using an over-the-counter product or you may hire a professional pest control company. If the problem persists, please contact our office. If your lease provides that you are responsible for the maintenance of the landscape, it is your responsibility to maintain all landscaped areas in the same condition as when you took possession. If your lease provides you with a gardening service and the grounds are not being maintained properly, please contact our office. Please contact our office if water from the irrigation system is spraying the house. Excess water can penetrate the window frames and damage the underlying wall boards causing a potential water problem in the home. Replace light bulbs that have burnt out after move in Replace batteries in smoke detectors and garage remotes if they go out after move in Replace air filter to the furnace 2 to 3 times per year, especially prior to winter and summer months. Some units have multiple filters. If you are unclear as to the location of the filters, please contact our office. Report any water leaks or needed repairs immediately. If repairs are not reported in a timely manner, they can lead to collateral damage, and you may be held responsible for the cost of repair for the collateral damage. You are responsible for clogged drains, including but not necessarily limited to kitchen sinks, bathroom sinks, toilets, laundry room sinks, washing machine drains, unless such clog is the result of tree roots blocking the main drain line. Caution should be taken with what, and how much, you put down the drains or garbage disposal. You may be able to clear the line with a plunger. If you call us, we send someone to clean the drain, and the clog is not from tree roots, you will be charged for the service call and repair. You are responsible to keep yard drains free of debris. It is your responsibility to keep mildew cleared off of walls. Mildew is not a normal condition. If exhaust fans or windows are placed in bathrooms, please use them in order to prevent the build-up of mildew. It is your responsibility to use all fixtures properly. If we discover that the problem is due to misuse or improper operation, you will be responsible for the cost of repair/replacement. Landlord Handbook. None of these explanations or abbreviations are intended to alter the terms of the property management agreement. 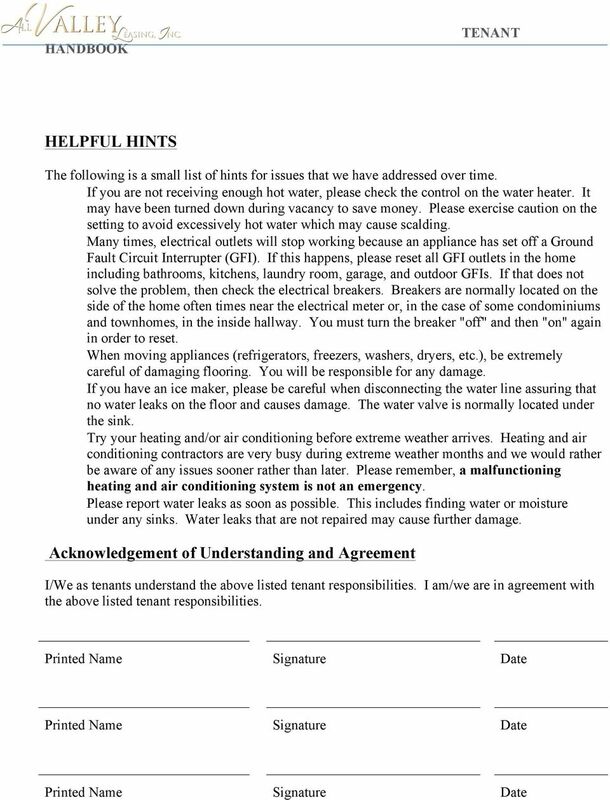 GENERAL USE ADDENDUM TO RESIDENTAL RENTAL CONTRACT 1. If Page One of the Lease Agreement does not allow pets, Tenant is not allowed to pet sit and pets are not allowed on the Premises for brief visits.